We specialize in and are geared toward light landscaping. This includes jobs such as garden landscaping, improvements, upgrades, renovations, sprucing up, specimen/accent plants, small retaining walls, and 1 or 2 day landscape jobs from scratch. Call us at (616) 698-7263 to learn more about customized landscaping in the Grand Rapids Area. 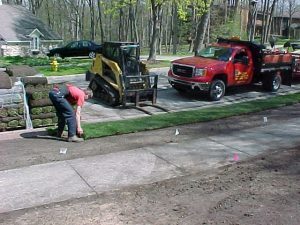 Since 1975, Bykerk Landscape Maintenance has serviced thousands of residential landscape and commercial landscape customers in Grand Rapids and the surrounding areas. We are based in Caledonia, MI and service all of greater Grand Rapids. Our Landscape professionals provide landscape installation and landscape maintenance. Not all landscape companies are created equal. Quality and professionalism are two factors that separate us as a landscaping company. We take pride in our work and will make an amazing impact to your outdoor setting! Landscaping and landscape maintenance is a reflection of life and a natural representation of a homeowner’s personality, attitude and, perhaps, even more. It develops an atmosphere of comfort for all that visit the home and a sense of pride and distinction for you, the homeowner. Our goals at Bykerk Landscaping in Grand Rapids, MI are simple: to provide you with the best possible service while maintaining the highest quality standards of landscape material, landscape installation, and landscape maintenance. By developing long term relationships with our clients and believing that landscapes are truly a joining of form, function and life, we can attain these goals. We treat your home’s landscaping like it is our own home. Mulch is usually replenished annually with a fresh 1-1.5 inch layer. While a base of 1-3 inches is desirable, thick layers and mulch piled high against trunks and plantings can be detrimental and should be avoided. Benefits of mulch beyond aesthetics are water retention for plantings, freeze protection, and weed suppression, all of which are important to the variable climate of Grand Rapids, Michigan. We can deliver and install hardwood mulch, color enhanced mulch, and cedar mulch! Weed management of landscaping beds is performed for aesthetics and to reduce or eliminate competition for moisture, nutrients and sunlight between weeds and desirable plantings. It is performed biweekly during the spring and summer months by means of pre/post-emergent chemicals, hand pulling, and/or cultivating methods. Healthy/dense ground covers and plantings also serve as a good weed management tool, as do coverings such as mulch, rock, stone, etc. 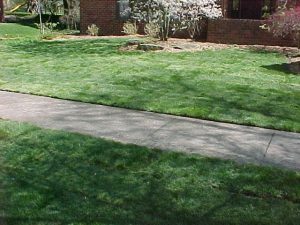 Edging can be done around your gardens and landscaping either mechanically or chemically using Round-Up. Beds should be edged minimally once per season for aesthetics and to ensure bed size is adequate for plant and turf health, care, and protection. Bykerk Landscaping understands the importance of first impressions. We take great care when upgrading your landscape because we recognize it does more than preserve or increase your property value. A beautiful landscape creates an inviting appearance that reflects on the level of excellence you offer to all those who enter your establishment. It creates a positive environment that has the potential to improve your business, while demonstrating you care about your customers, employees, or tenants. That’s why we are honored when you choose us to enhance your image through exquisite outdoor environments. We use an ASV track machine with appropriate attachments for your large project needs. This machine is powerful enough for most jobs, yet small enough to minimize damage and allow for needed maneuverability. The factory installed tracks provide superior flotation through soft, wet, and loose areas and is easy on the turf. Skid loader service is available in the winter for stacking or removing snow on commercial properties with limited areas for snow pile placement. Proper watering is important to a landscapes health to avoid creating or compounding existing problems. Consideration should be given to frequency, amount, time of day and using the correct sprinklers which are properly adjusted. Call us today for a free consultation related to your home or business at (616) 698-7263!